Shipston-on-Stour advanced to the next round of the RFU Senior Vase with a 41-7 victory over Old Saltleians at Mayo Road on Saturday. The Rams quickly got into their stride, playing with good pace and intensity to catch their opposition off guard and get deep into their half. With the ball won at a line-out, James span it left to the backs where a gap opened up for Tobi Faulkner who stepped inside the covering fullback to touch down and James added the conversion. A penalty from James stretched the lead before Robbie Faulkner spotted space behind the defence and chipped the ball out wide where Matt Daniells latched on to the kick, gathered in front of the fullback and raced clear under the posts before adding the conversion. 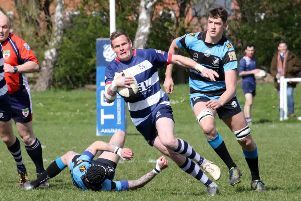 Harry Clark was sin-binned for another high tackle before the break but after the restart Shipston improved their discipline and had much more possession and field position. The third try arrived from another clever kick into space by Faulkner. Charlie Hollies-Everett and Scott Brandreth sucked in the Salts’ defence, Faulkner dinked another chip over the top for Leon Daniels to score. Tobi Faulkner intercepted a wide pass and sprinted clear from 50 metres out to score. Shipston’s fifth try arrived when the ball was won from a scrum and sent wide to the right by replacement scrum-half Karl Slatter. Tom Corby released James through a gap and a final off-load inside to Clark saw him trudge over the line. The Rams scored a sixth try when full-back Ed Cowper was just about to pick the ball up and scamper over the line when he was hauled down and a penalty try awarded. Shipton’s defence was finally breached when Salts scored a late but deserved consolation try.